For nearly 30 years, public radio listeners in the Northwest and beyond have tuned in to listen to Inland Folk, hosted by Dan Maher. For many, Maher is a living encyclopedia of folk music, local as well as international. Northwest Public Radio's Behind the Mic decided to take a peek at how Dan produces the show each week, and learn a little more about what Inland Folk is all about. Click below to watch the video. Dan grew up in Spokane, Washington and began listening to the radio with his sister at a very early age. To learn more click on the video below. A little-known fact is that Dan played the drums before he picked up the guitar. To learn more about the start of his musical career and hear a sampling of Dan singing the Beatles song "I Saw Her Standing There," click on the video below. In the late 60's public radio took its first steps - and Dan was there listening. As the years have passed Dan has observed many changes to public radio. To hear Dan's opinion on the role of local programing on public radio, click on the video below. Dan has been a performing in the Northwest for years. This summer he performed on the campus of Washington State University. Below are a few of the many great songs that he performed. Look closely and you might spot a few Northwest Public Radio employees in the audience! 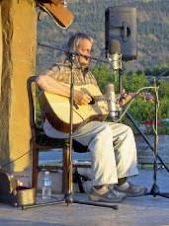 Inland Folk with Dan Maher is an eclectic program of folk music with a thirty year tradition in the Northwest. Folk musician Dan Maher brings listeners the music of local and national folk artists on Inland Folk every Saturday from 11 – 2 pm. He also performs music all over the Northwest and works full-time for Washington State University Student Involvement. Dan has been sharing his tremendous knowledge of music with his audience for more than twenty five years. Inland Folk actually began on Spokane Public Radio and Dan rode a bus from Pullman to Spokane every few weeks to produce two or three programs at a time. He hauled a variety of music on those trips. For many years now, Dan has recorded the program in Pullman. He is his own producer, editor, engineer and host – and his audience loves what he does. The program has expanded from a one-hour show to the three hours of folk music it is today. Inland Folk still airs on Spokane Public Radio as well. Dan volunteers his time to help both Spokane Public Radio and Northwest Public Radio during fund drives. He has asked for pledges on the air, performed live for hours and offered free concerts as incentives for financial support. Dan is himself a supporter of both Northwest Public Radio and sister station KWSU/KTNW Public TV.